Ann and I love going to our nearby Portsmouth Farmer’s Market. Each Saturday from May 7th through November 5th starting at 8:00 until 1:00 pm the parking lot at Portsmouth NH City Hall becomes a huge outdoor market with locally grown and processed foods of all types from vegetables, to meat and cheeses along with other locally sourced products like goat’s milk soap and candles. This Saturday they had a friendly group of ladies demonstrating how wool gets from a sheep to you in the form of clothing. 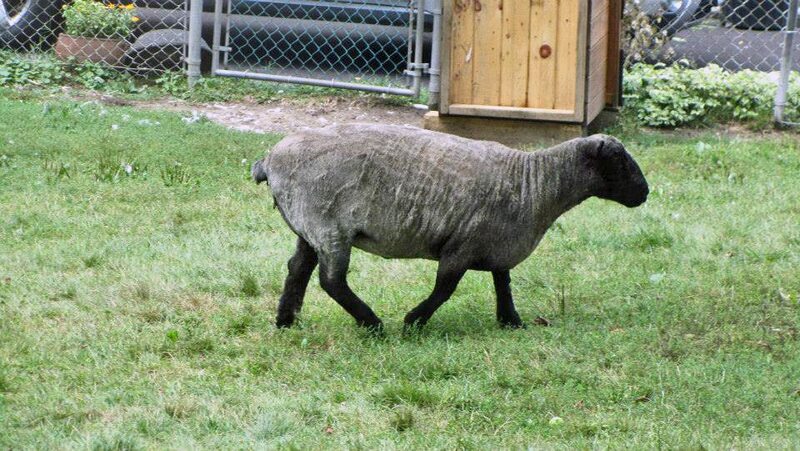 First you start with a sheep, shear its wood off, wash it, and then you’re ready to begin.. Step 1 is to ‘card’ the yarn which simply means use a big, stiff brush to align all the fibers the same way. 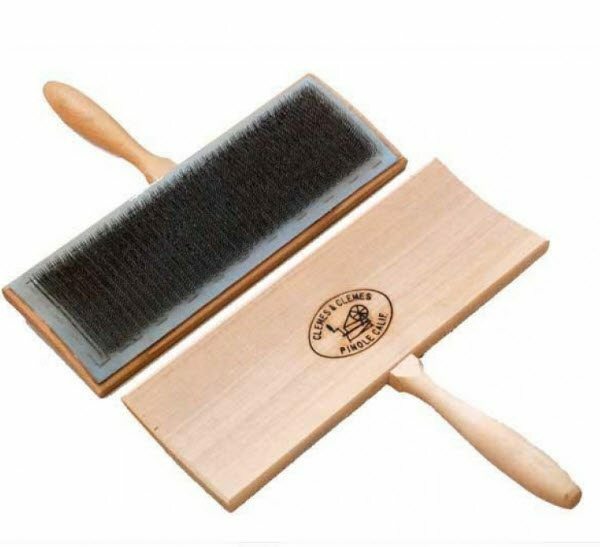 This is what a carding brush for wool looks like. Essentially it’s just a bug brush with stiff bristles. After the raw wool is carded and the tangles are combed out and the fibers are aligned it’s ready for the next step. The brightly colored wool is Angora from goats. they were mixing the Angora with sheep’s wood to make the resulting yard a bit more silky. The Angora and wool combination gives a nice color once they’re blended together. Step two is to spin the freshly carded wood into yarn. 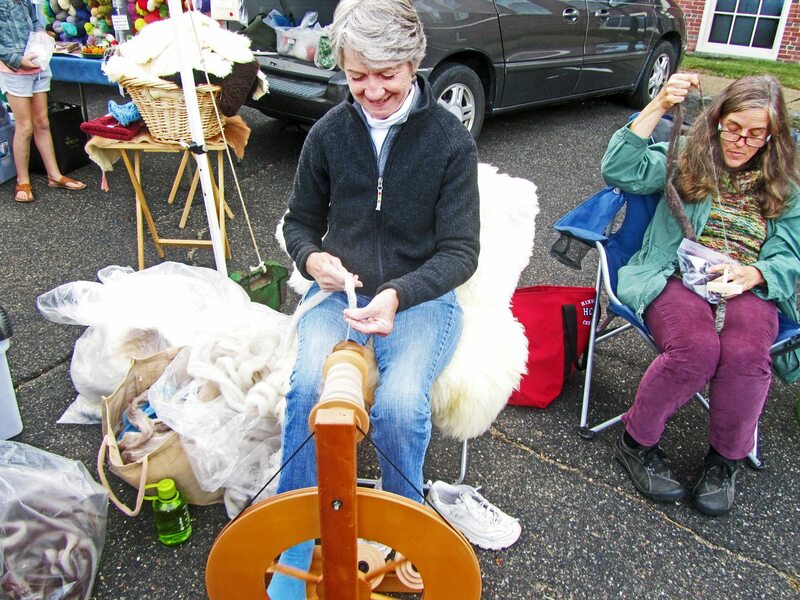 The smiling lady below is feeding her wool into a spinning wheel which tightly twists it into yarn and rolls it onto a big spindle called a bobbin (that’s the round spool between her knees that has the yarn on it). 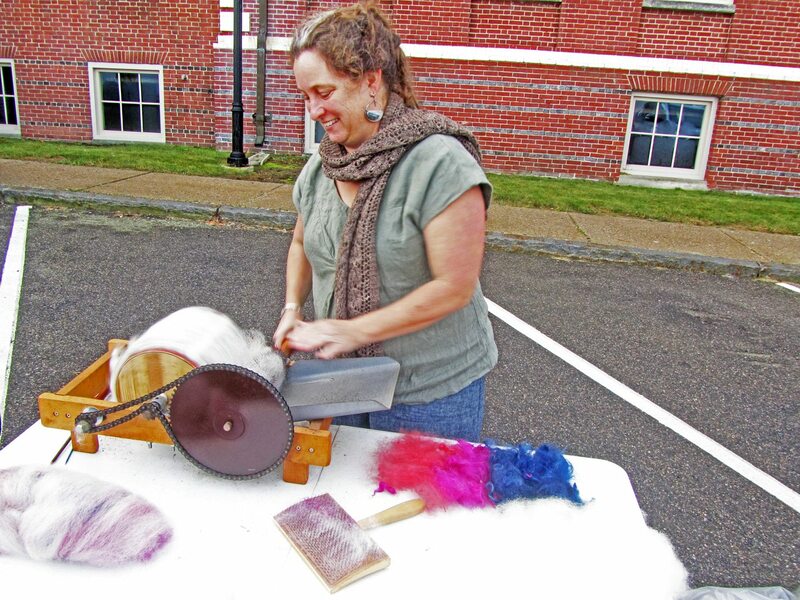 This lady is spinning wool into yarn which can then be used to make sweaters, scarves, etc. 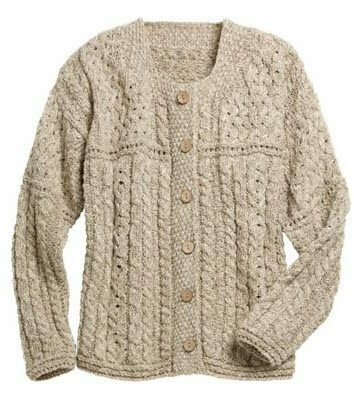 After you shear, wash, card, and spin the wool, you’re then ready to turn into something beautiful and useful to keep you warm. We love the New Hampshire Seacoast and especially our beautiful home town of Portsmouth. If you have a real estate need, either buying or selling, we would love to talk with you about Portsmouth NH estate. You can see all the New Hampshire Seacoast homes for sale on our website as well as find some great area information as well as buying and selling tips.